People for the Ethical Treatment of Animals (PETA) is known for their attention-grabbing promotions and advertisements—and this time they’re after your childhood favorites. 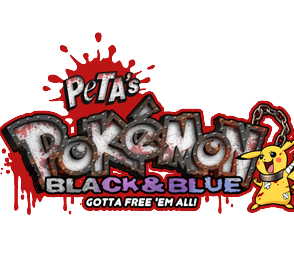 The organization is garnering a burst of online attention for a parody game they’ve released, “Pokémon Black and Blue,” a play off of the newest Pokémon titles, Pokémon Black and White. In the past, PETA has released other games such as “Cooking Mama: Mama Kills Animals,” “Mario Kills Tanooki,” “New Super Chick Sisters” (a Mario Brothers parody), as well as several other games targeted at raising awareness of animal welfare. They’re all relatively simplistic in terms of actual gameplay with a heavy focus on getting out the organization’s core message. Representatives from Nintendo have yet to comment on the game. As the game is a parody, there are few grounds for legal action, though Ninetendo has made statements on PETA’s previous efforts like Mario Kills Tanooki, telling magazine Eurogamer, “Mario often takes the appearance of certain animals and objects in his games,” in response to claims that Mario was depicted as wearing Tanooki fur. In this latest effort, you play as Pikachu, battling bottle and bat wielding trainers with familiar attacks like Thundershock as well as PETA creations like “Group Hug,” “Shame” and “Protest.” At the end of every battle, there is a brief speech about the rights of Pokémon and the some details about cause of Pokémon liberation—a thinly veiled metaphor about the group’s actual focus on animal liberation and welfare. The game also contains several “treasure chests” that contain various prizes. PETA has heard you “like Mudkips” and offers that “Mudkips bear gifts” in the form of Pokémon Black and Blue desktop wallpaper. Other prizes include your own set of Pokémon Black and Blue trading cards available for download and a bonus PETA video depicting conditions the group finds fault with, shot in locations like slaughterhouses, animal testing labs and so on. The finale of the game comes when you battle your former trainer, Ash, dressed up in a bloodied ringmaster’s uniform, holding a whip and a bullhook. The last screen congratulates you for the fact that “you crushed the trainers’ resistance and have succeeded in giving them a higher calling,” suggesting what PETA’s aims are for the game itself. How successful the game is at raising awareness of animal rights issues and bringing people to the cause is uncertain—but Pokémon fans are likely to be less than thrilled with the message of Pokémon Black and Blue.